Many universities operate small (less than 1m) optical telescopes for student observing and research. 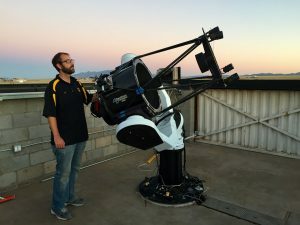 While these telescopes can do great research with photometric observations, relatively low-cost options are rarely available to do spectrographic observations. Spectrographic observations allow us to determine the elemental composition, temperature, density, motion (both translational and rotational), and even magnetic field strength of objects. My research focuses on two different designs for spectrographic instruments. We have developed a “Compact Grism Spectrometer” with an average spectral resolution of R ~ 300 that fits inside of many commercially available filter wheels and uses prisms to shift the first order spectrum back onto the field of the CCD imaging camera near the source object. This instrument is built with commercially available optics and encased in a 3D printed housing. Our other instrument, the IRES (Intermediate Resolution Echelle Spectrometer) is a fiber-fed echelle spectrometer with an average spectral resolution of R ~ 7,000. It is also built with commercially available optics and 3D printed assemblies.